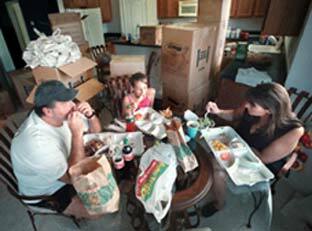 American families want to eat together, they just don’t want to cook. No wonder the kitchen is always so clean. According to the influential food-industry researches at the NPD Group, the proportion of American dinners that came out from a takeout counter or a grocery freezer increased by 24 percent in the past decade. “We thought the microwave would be a cooking appliance, “ says NPD vice president Harry Balzer; instead it found its apotheosis in reheating takeout macaroni and cheese. Jeffery Sobal,a nutritional sociologist at Corne University in New York, thinks the trend toward healthier eating is responsible: Americans have finally gotten the message that it’s bad to eat a bucket of fried chicken larger than wastebasket, so they’re doing it at home where no one can see them. Of course there are people you wouldn’t expect to cook at home, like Steve Traxler, an unmarried Chicago theater producer, whose refrigerator contains little more than orange juice, wine and leftovers. Or empty nesters like Pearlie Carter, 68, who put in her time cooking for her family and is perfectly happy to buy Thai steak strips or teriyaki chicken breasts at the ultrafancy Shaw’s supermarket in downtown Boston. Well, somebody must be using those cookbooks, right? “People don’t have time to cook; I think they’re reading them in bed,” says Rozanne Gold, the author of a popular series of cookbooks. It’s not entirely a question of time. The takeout boom is fueled, in part, by the popularity of foods like sushi, which even adventuresome American cooks are unlikely to try to make at home. 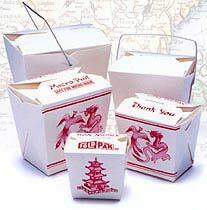 And takeout fills another need as well, for the phenomenology of the home-cooked dinner: the family gathered at its own table, the familiar smells and tastes, the pure white of the mashed potatoes against the golden skin of the chicken. As for those lemons … maybe we can just squeeze them over the broccoli florets with sesame-ginger dressing instead.